Image: JJ Williams. For more check out JJ's Flickr album from the tapings. - Oney Lorcan defeated Wesley Blake with a running blockbuster. - It was announced on the video screen that Shinsuke Nakamura vs. Samoa Joe will happen at TakeOver: Toronto for the title. Great reaction for No Way Jose and Swann. The crowd chanted for them the entire match. Jose hit a half nelson slam on Gulak for the win. Roode hit an impaler DDT for the win. Tye Dillinger ran down after the match and they had a scuffle, with Dillinger getting the upper hand. - Peyton Royce and Billie Kay attacked Liv Morgan backstage before making their way out to the stage. Royce and Kay put the entire women's roster on notice. Big crowd reaction for Strong as he made his debut. He won it for his team with a gutbuster and sick kick combo. Cross beat Kamela fast but kept attacking until the decision was reversed. - Shinsuke Nakamura tried to cut a promo on Samoa Joe but was interrupted by Patrick Clark. Nakamura took him out with one kick. 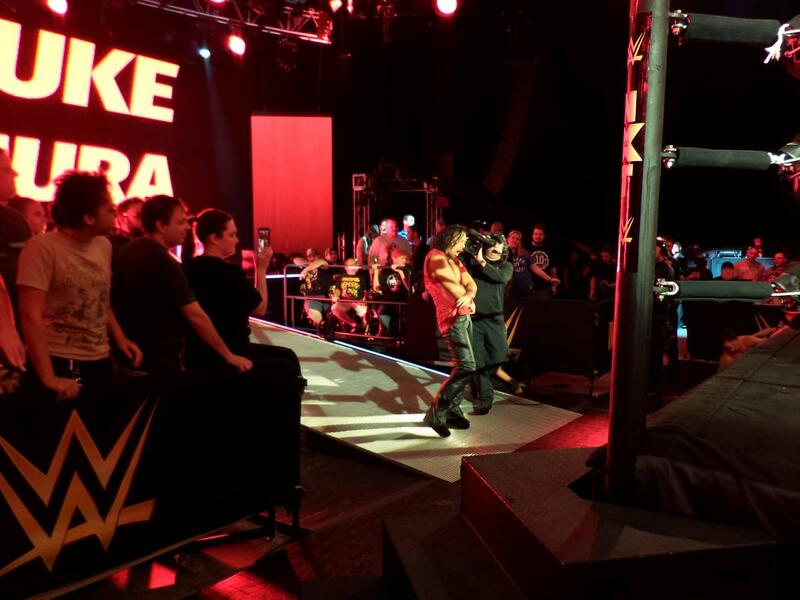 Joe made his way to the stage but stopped short as Nakamura saw him coming. - A superkick and running knee combo on Lun for the decisive win. Liv Morgan ran down to attack Royce and caused a distraction, allowing Aliyah to pin Kay. The heels beat down Morgan until Aliyah finally joined in to even the odds, but the Aussies were too much for the youngsters. Perkins subbed in for the injured Hideo Itami. Very good match, the crowd loved Ibushi and Perkins. Perkins got the win with a kneebar, and he got Ibushi to dab after the match. - William Regal then announced on the tron that he had found Asuka an opponent for TakeOver. Mickie James was shown on the screen and cut a promo on wanting the title and how she paved the way for the women's revolution. The match was officially made for TakeOver. Dillinger hit the Tye Breaker for the win. Roode attacked Dillinger after the match. Evers was Rachael Ellering with a name that paid tribute to Lance Storm. Top rope stunner by Moon for the win. - Gargano and Ciampa received a bye in the Dusty Classic due to The Revival not being able to compete. Dawson cut a promo on the stage saying that he is injured. The Authors of Pain came down in an attempt to rough up DIY but were sent packing. This was a fast one. Cruz is in town for EVOLVE this weekend. Kay got involved when Morgan had a submission on. Aliyah tried to make a save but was no match for the heels. Ember Moon made the final save and sent the Aussies packing. This was a long match, and Almas was in full heel mode. He had a hat, suspenders, and sparkly pyro. Alexander had hit a lumbar check but Almas got the ropes, then was able to hit his leg sweep DDT for the win. - There was a contract signing in the ring with Shinsuke Nakamura, William Regal, and a crew of Performance Center security guards. Samoa Joe refused to enter the ring and cut a promo on Nakamura, Regal, and the crowd. Regal brought the contract up the ramp for Joe to sign. After Nakamura signed the paper, he got in a brawl and destroyed all the security guards, even putting one through a table. Eric Young and Nikki Cross were on the outside for added intimidation. The larger heels worked over Perkins most of the match. Ibushi made the hot tag and ran wild. He hit the powerbomb for what would have been the win, but major distractions led to Sawyer Fulton getting the pin on Ibushi after their double team finisher. The show seemed to go off the air, but Shinsuke made the save as SAnitY was beating down Perkins. Nakamura hit a Kinshasa on Wolfe to send everyone home happy.